Without genuine wide midfielders, it was Milner’s role to not only provide the width in possession but also to slot into a central role without the ball and keep the midfield compact. Defending with three central midfielders meant there was always a spare man available to break the line and press the ball, with two men back. But the way in which Liverpool pressed the ball was asymmetric; they attacked it in different ways on each side of the pitch. On the left, Emre Can was the primary presser, a job he completed very well. 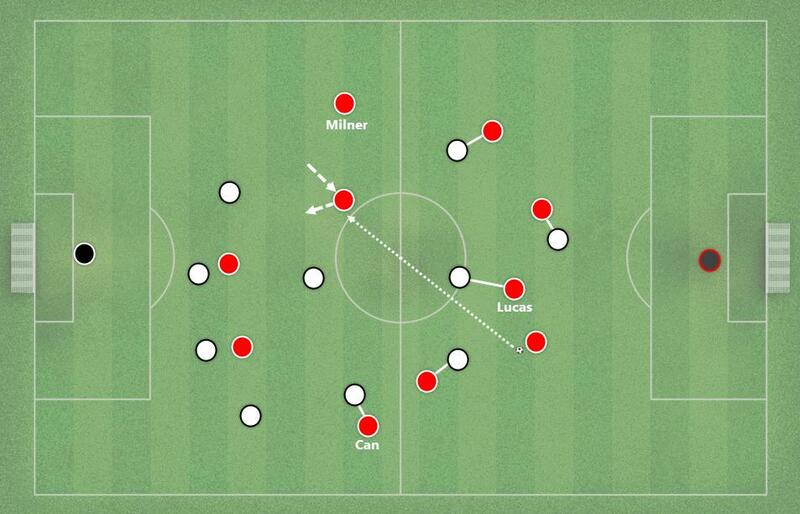 03:02: Liverpool’s main pressing scheme on the left side. Can moves forward from midfield, and is covered well by Lucas. 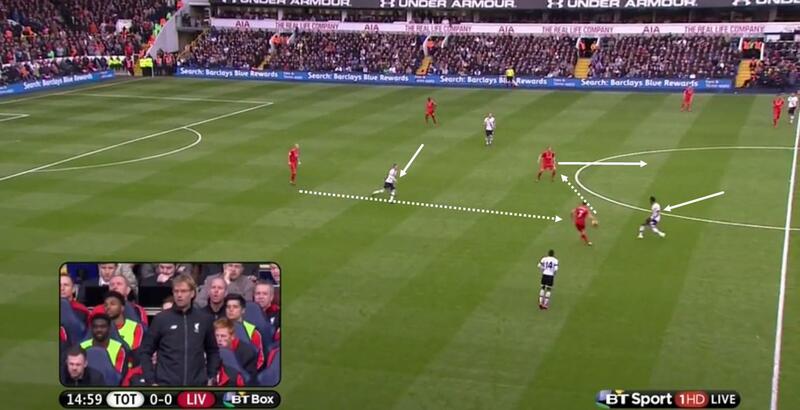 Previously, this would have left a far-side gap in Liverpool’s midfield. One of Tottenham’s forwards would have dropped deep and picked up the ball from the defense in the space where Lucas previously was. But Klopp seemed to account for this, as Milner regularly shifted across. However, this didn’t happen on both sides. When Milner pushed forward to press and Lucas again shifted laterally to cover for him, Emre Can was often nowhere to be seen. This was also an issue when Lucas pushed forward to press. Lucas moves forward, with Milner also pressing, and Can must move across to guard the central zone. Dude, seriously? Spurs break through into the area Can is supposed to be in, and it ends with a corner. And yes, that is Adam Lallana sprinting towards his own goal to cover for Can. There were more examples, and this seemed to be one of the reasons Liverpool & their press slowed down after only 30 minutes, at which point Spurs regained control. However, aside from the slow lateral shifting of Can, the pressing of Tottenham’s left side in build-up phases was fairly stable. 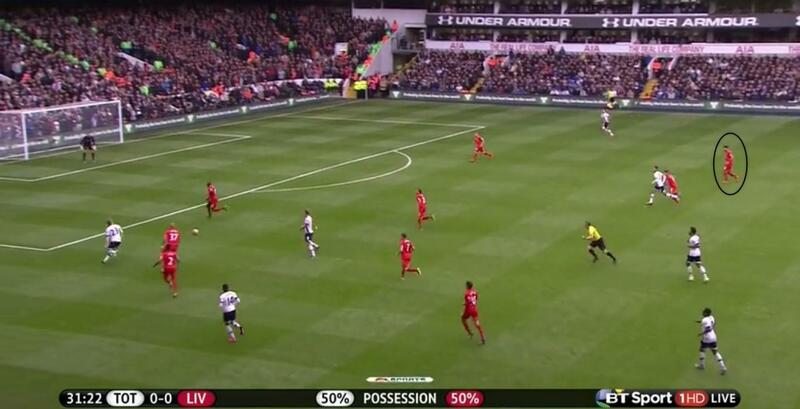 39:54: an example of Liverpool’s pressing shape when Tottenham were attempting to build play through the left side. Milner & Lallana were happy to interchange roles in this system, with whoever was wider engaging the left-back when they received the ball. The other would merely drop inside and cut out the passing lane to the near-side CM (in this case, Dembele). If the far-side CM (Alli) would come across to help build-play, then Coutinho would follow him over and immediately pressure him if he did receive the ball. 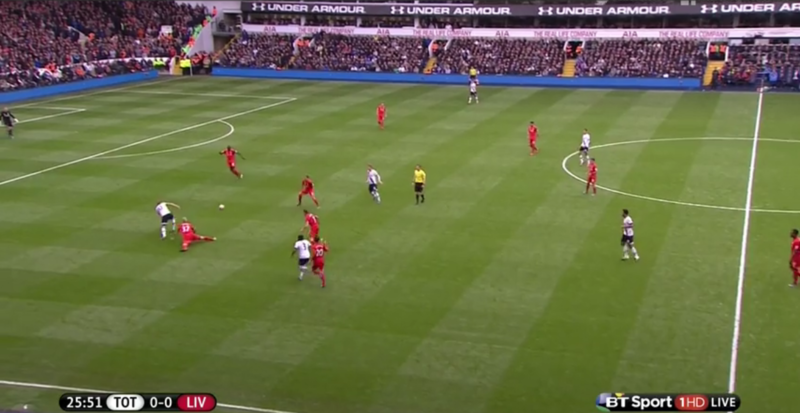 With Origi pressuring Vertonghen, Spurs were often forced into a long-ball forward. 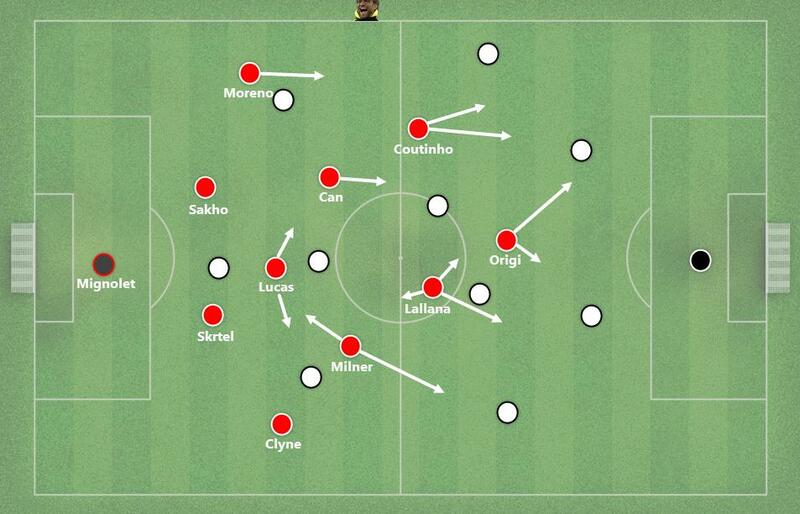 Liverpool also saw a major change in their approach to counterpressing (or gegenpressing). The positioning of Coutinho & Lallana in the halfspace rather than wide allowed them to easily press the man on the ball as soon as it was lost. Lallana, in particular, was effective in regaining possession almost immediately after losing it. Despite obvious improvements to defensive structure and compactness, Liverpool seemed to have the same inability to create big chances. Only one major chance was created, where Origi struck the crossbar from a header; even this came from a set piece. In early build-up phases, Lucas dropped deep behind the midfield. But often he seemed unable to progress play as he had few central passing options against a well-organised Tottenham press. This meant much of the progress came from two different situations. Firstly, a wide player dropping back. 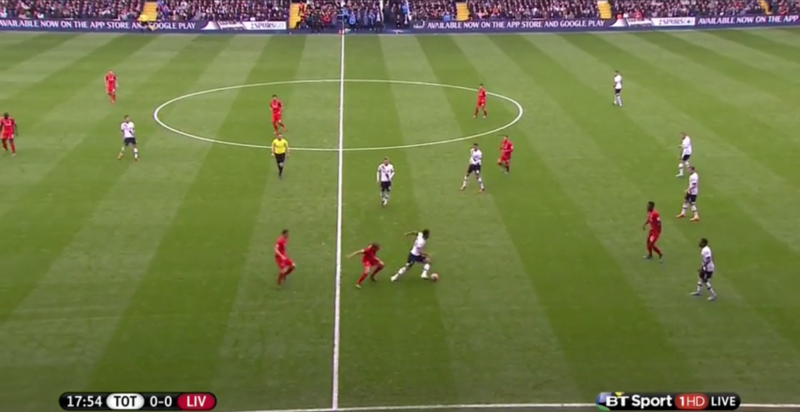 This is something Coutinho has been doing for seasons, but James Milner was more influential at this against Spurs. Milner drops deep, freeing Lucas to move forward and receive the ball from him. Unfortunately, Lucas is not Ilkay Gundogan (or even Sven Bender!) and he loses the ball. But this created some issues. Particularly when Tottenham’s midfield press was switched on. Adam Lallana drops deep to aid the stagnant build-up play, but Dele Alli is alert to the situation. Lallana receives the ball in a difficult situation; back to goal, and with few passing options. Alli hassles him, and Spurs are able to create a dangerous chance for Clinton N’Jie, only stopped by a wonderful Simon Mignolet save. Ideally there would be more input from Emre Can in these situations, who drifted forward in build-up phases. It remains to be seen whether this was an instruction from Klopp, or Can’s natural inclination; but it is important Liverpool do not end up relying on Lucas’ passing ability to build possession from the back. The other method Liverpool had of building play, one which they will have whenever he plays, is Mamadou Sakho and his ‘laser’ passes into the attacking midfield strata. Much like when Klopp was at Dortmund, and Hummels was his ‘get out of jail’ card in build-up phases, Sakho is also capable of playing accurate passes straight into his forwards. 61:05: not many CBs are comfortable playing this pass. His CMs are all contributing nothing to build-up, so Sakho takes matters into his own hands with a quick pass straight into Lallana’s feet. Aside from build-up play, Liverpool also hardly threatened in transition. With the players seemingly so focused on pressing the ball and restricting passing lanes, they forgot that it is also vital to be well positioned for an immediate attacking transition. With only three days of work with the full squad, it is perhaps understandable that they don’t have a complete grasp of this facet of pressing yet. 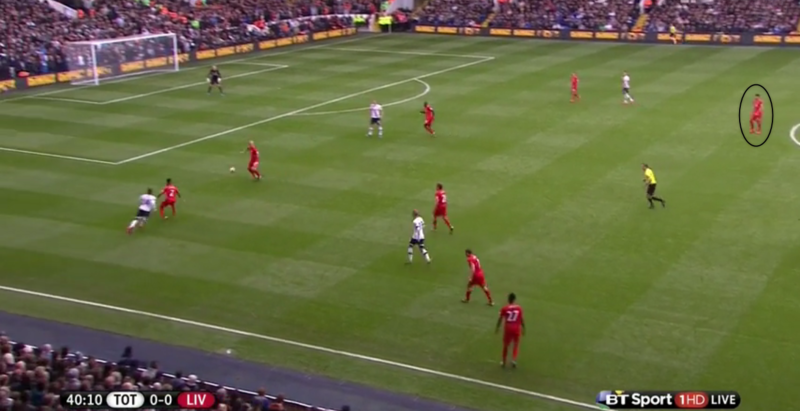 Much of their play in transition against Tottenham seemed based around solo-play. Divock Origi & Philippe Coutinho both seemed expected to create a dangerous transition on their own, a very difficult task. But it should be acknowledged that this is something Daniel Sturridge is comfortable doing. When the ball is circulating from deep, he will often drift wide before moving back into a central zone as possession moves into midfield. Not only does this create uncertainty amongst the opposition defenders, but it also creates momentum for him to move onto the ball quickly and interplay with teammates. Origi is not quite as intelligent. In this system that Klopp has created in only several days, it seems fairly clear where some of Liverpool’s key missing players could fit. Jordan Henderson is a clear fit for either Can or Milner’s role, and being part of a pendulating three in midfield would allow him to make use of his work rate to press forward. Given Can seemed less comfortable shifting across and covering for Milner pressing forward, it may be that Henderson should come in for Can rather than Milner. Henderson’s impact in the final third has vastly improved over the past two seasons, and having Milner to shift across and cover him would be a key part of maintaining stability in defensive transition. Firmino could fit into either Lallana or Coutinho’s roles. He has a slightly different player profile to either; more comfortable running in behind, but also a creative threat and adept at pressing. Lallana had a promising game with & without the ball, but was clearly tired after forty minutes and was eventually subbed. Being able to start two of these players and bring on a third to maintain a strong press is a good position for Liverpool to be in. There is much work still to be done for Klopp and his coaching staff, but thirty minutes of play have already given us an indication of what his Liverpool may look like. The start of a very very successful career at Liverpool I hope unlucky not to win the league cup against Man City I think both Klopp and the squad deserve a win on Wednesday in the Europa league final. Come on you redmen! Come on Kloppo! YNWA!